We will look at proper ways and body mechanics to get into wrestling with the messer. Following up we focus on how to use the messer and every part of the body in a close distance. Using patterns in movement as a trainings method, talking about the meaning of impact and pain to make things work, plus keeping in mind to have a plan B will also be a topic. 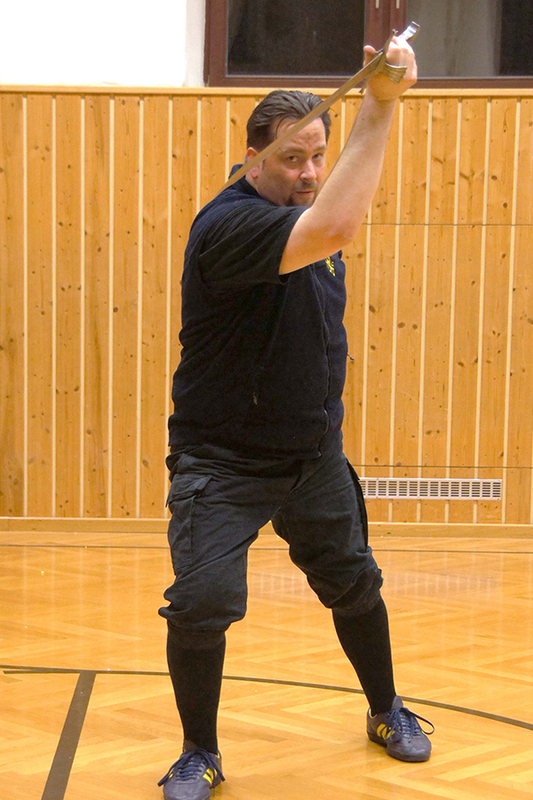 Martin Enzi first got in touch with martial art, by practicing classic boxing, but finally switched to practice HEMA in 2001 with the longsword. 2003 he got his hands on the first transcription of Johannes Leckuechners “Kunst des Messerfechtens”, while work on it was still in progress. Instantly fascinated, while reading the first pages of the manuscript, his passion for Messer started. 2005 he started out as a trainer for longsword, Messer and in the following years also for peasant weapons and spear. In the same year he took part in the transcription of parts of Paulus Hector Mair (scythe, sickle and flail) for the Higgins Armory Museum. Even if training traditional Liechtenauer longsword and peasant weapons from PHM was always a topic his main focus and deep passion lies on the Messer according to cgm582/Johannes Leckuechner. Of course other sources, which are also talking a bit about Messer (Talhofer, Wallerstein, Pauernfeindt, …),are going along with that. Next to HEMA he practices stagefighting since 16 years and is working occasionally as a stunt coach and choreographer for Movies and TV.